I came across this old-school infographic and thought it might be useful! 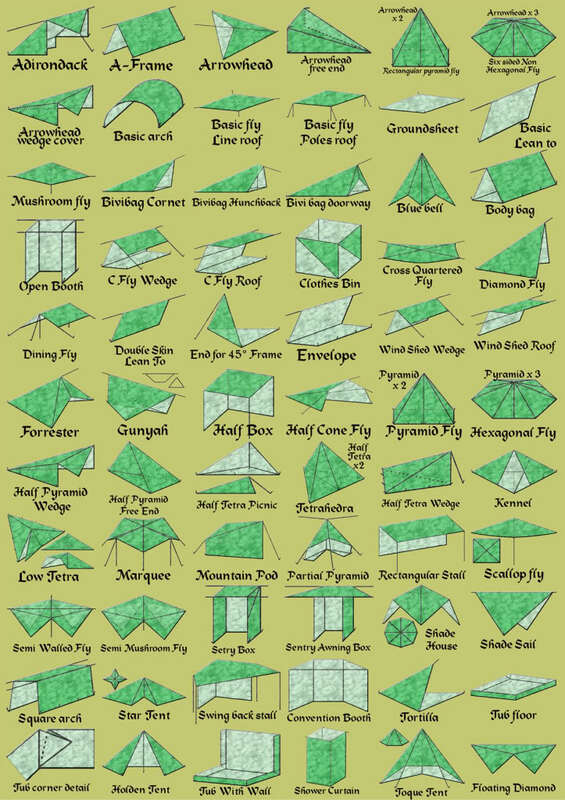 There are some very elaborate uses for tarps here, but you never know when you might want or need to make one! Well, mosquito season is upon us, and Darren came across this article which explains how to set up a very quick and easy mosquito deterrent for your backyard: an oscillating fan. Mosquitoes aren’t very good flyers, and we all know that a mild breeze is enough to keep them at bay. On a calm evening, why not make your own breeze with a fan! Of course, this won’t work when you’re on your canoeing trip, but it will work when you’re out in the backyard getting your equipment ready, like testing your survival gear (part 1, part 2, part 3)! 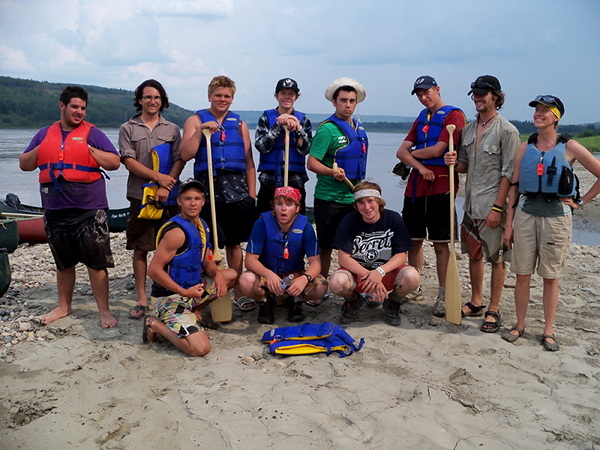 We’ve been busy with some canoe instructing lately. If you’re in or near the town of Peace River, I believe there is one spot left for a youth for the town’s Extreme Adventures camp on August 16th. Call the Town to sign your child up. If you are an adult interesting in getting some lessons, you can partake in the half-day lessons on Saturday, August 17th, at Leddy Lake. This is a part of Paddle the Peace — check out this page for more info. We are getting quite booked up for events such as canoe parties, so if you are thinking of having one, please contact us soon or we won’t be able to fit you in! Hope you are all enjoying your summer so far! We are busy getting ready for some canoe lessons for a Girl Guide group next week! It is going to be a lot of fun! Remember, we don’t offer scheduled guided trips, but if you have a few people who want to go with you, call us and we’ll get you all set up for your self-guided trip (day trip or overnight trip). There are SO many options and great places to go! A few times a year, we may be able to come along and guide your trip, so call us soon if that’s what you are interested in. Just had to take a minute and share a unique getaway in a river! 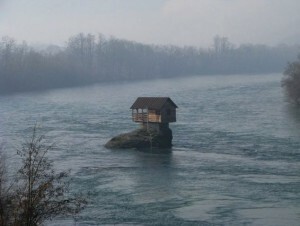 From cbc.ca, there is a tiny one-room cabin perched on a rock in the River Drina in Serbia. Thank you, CBC! 🙂 Original article is here. I thought it might be useful to take some time to explain how maps work. The Earth is divided into sections, using lines that run North-South and lines that run East-West. The size of each section depends on the scale, such as 1:250,000 or 1:50,000. The larger the second number in that ratio, the more “zoomed out” the map is. If you think about it, 1:1 would be a life size drawing, so the bigger the ratio, the more of “real life” is represented on the piece of paper that makes up the map. These more-or-less rectangular sections are grouped into 4 x 4 grids. Canada is divided up into large numbered sections, with numbers increasing from East to West and North to South. 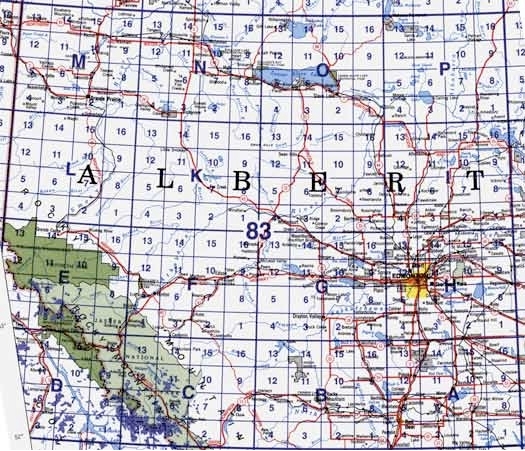 For example, Saskatchewan is essentially 72, 73 and 74, Alberta is 82, 83 and 84, and BC is 92, 93 and 94, with the larger number being farther north. Within each, the land is further subdivided into 16 sections (in a 4 x 4 grid) and given letters as names. Again, each lettered sections at the scale of 1:250,000 are divided into 16 maps (4 x 4 grid) that are numbered. See how “D C B A” goes across the bottom? Letter A is in the lower right corner of section 83 in the map above — the letters zig zag their way through the grid, from A to P. The numbering within each section, 1 to 16, is in the same manner. See the Peace River squiggling its way from the lower left corner to the upper right? On this map, it comes on the scene in D4 as little blue line. Suppose, however, that you want to start your trip at Notikewin Provincial Park — that’s the green blob in section F which the river flows past. You will need to get maps for 84-F (1:250,000) or for more detail, F3 and F6 (1:50,000). I can give you a tip: for the Peace River, you don’t really need the 1:50,000 scale, which is a good thing, because if you did, you’d need a LOT of maps. The 1:250,000 scale work well enough. For the Hay or Chinchaga rivers, you’ll want the 1:50,000 scale. For my own use, I open the maps in my computer and crop out the parts I don’t need and then get them printed on 11″ x 17″ paper. They work great this way! Now, to find a specific spot on the Earth, you need coordinates. Latitude and longitude is the old way of doing it, and the numbers increase from East – West and South – North. To remember how it works for longitude (East-West coordinate), a good way to think of it is that’s the direction that the sun moves across the Earth — it rises in the Maritime provinces before it gets to the prairies. As for latitude, the higher North you go, the bigger the number. You can use degrees, seconds and minutes, or simply decimal degrees (such as 54.43532 N) for both coords. 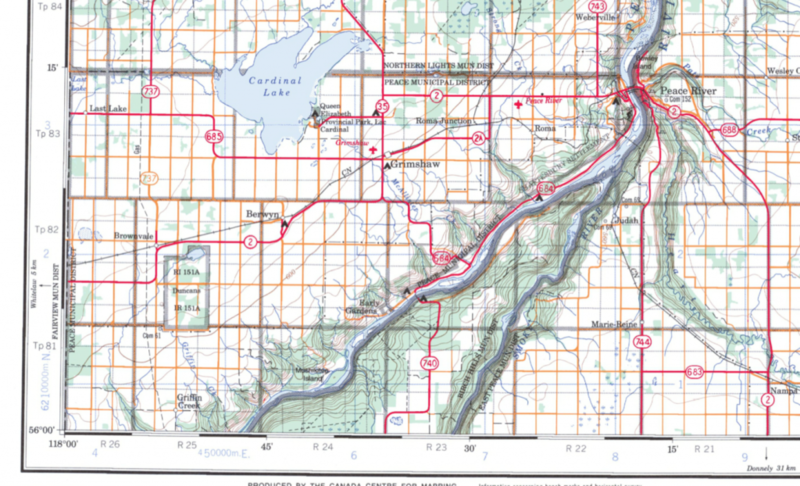 Look at a 1:250,000 topo map like the Canadian Government makes available (a portion above). 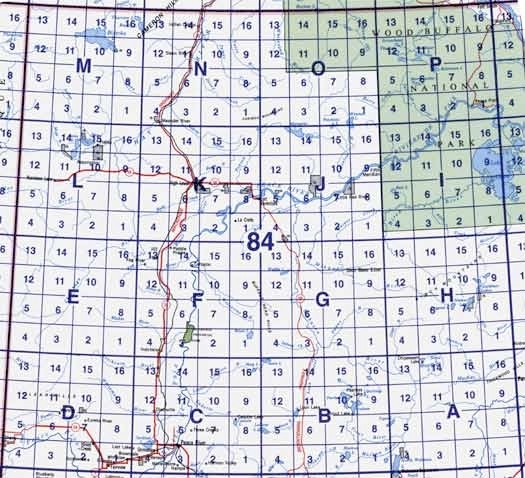 The UTM coords are indicated in light blue letters and grid lines and the Latitude/Longitude is in black along the sides of the map. Lat and Long have no grid lines spanning the map. The multitude of orange lines everywhere are gravel roads and they delineate sections, such as farmers use. The grey fat lines (and corresponding grey letters using R and Tp) indicate townships and sometimes county boundaries, but that’s a whole other geography lesson! So, if you had to figure out where you were, you could read your coords off a GPS and then find them on the map by seeing where the two numbers cross. You might be thinking “but my GPS display will show me where I am.” That is true, however, when you are in the wilderness, you may find your GPS unit to be surprisingly non-useful — it will show you nothing if there are no roads or labelled features in its database. Wilderness = big empty space. This, of course, is not true! Wilderness = trees, creeks, wetlands, more trees, shrubs, hills, valleys, ponds, and so on. Of course, the beauty of topo maps is seeing the slopes (topography). This gives you heads-up as to where the highest banks along the river will be, and where creeks flow in. Just a couple other notes: green areas are undeveloped (crown land) and designated parks. White land is, essentially, land that is owned by someone (farm land around here). Blue is obviously water, and marshy areas or wetlands have little, well, marshy symbols! Black dotted lines are usually cutlines and/or seismic lines, but can also be pipelines or quad/skidoo trails. There is an abundance of information portrayed on a map once you know how to read it! Aren’t maps great!? For more about the National Topographic System of Canada, go here. In the spirit of sharing, inspired by Derek Sivers, the amazing guy who started CD Baby and made it into a phenomenal success, I thought I’d share some paddling tips I’ve learned over the years. The ones below are for expeditions in particular. Give yourself more time, not less. Whenever there’s question of how long it might take to paddle a certain stretch of a river, always plan for more time instead of less. Bring extra food. Then, if you’re using a SPOT device, your pick-up person will see you’re running a little behind and pick you up later. You don’t need all the fancy gear. A quick-dry shirt and pants that dry fast are about all I would say you need as far as particular clothes. You don’t need expensive wool long johns — they are $100+ in some stores! — any old pair will do. Boring old rubber boots, whatever water socks or sandals you like. It’s one of the best hobbies for not needing a lot of specialized gear. I hate to say it, but MEC and similar places make you think you need to spend hundreds on clothes, but you don’t. At all. The only exception to this, I’m afraid to say, is a good quality bug jacket and hat! Bring extra socks. When you’re cold and wet, nothing feels better than a clean, dry pair of socks. And they are so small, it’s easy to pack a few extra pairs. Along those lines, always have two pairs of footwear, such as sandals and rubber boots, or running shoes and boots. Try to keep one dry at all times, so you have can have happy, warm feet in camp. Follow along on your maps. Always keep track of where you are. You never know when you will need to go for help. 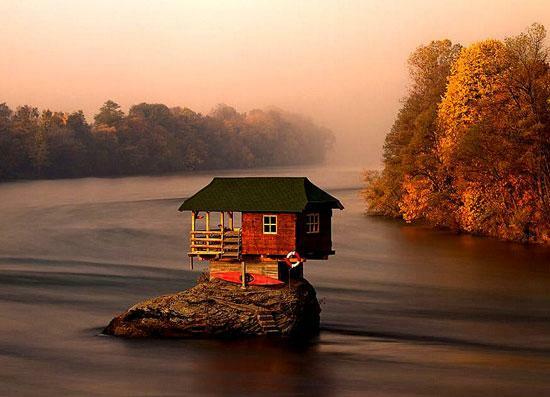 It can be tricky on bendy rivers, but you have to find a way to do it. GPS units are great too, but don’t assume yours has any good databases showing the rivers — check first. You can always use your GPS to confirm your location by looking at your current coordinates. If you don’t know how to read a map, learn (I’ll do a post on this another time)! It is also a very good idea to know the wilderness rating of the river you are going on. Wear some type of footwear at all times. It can seem so fun and fancy-free to be barefoot in your canoe, but if something should happen and you get separated from your boat, you might need to walk out. Doing so barefoot would be a thousand times harder than even the skimpiest sandals (running shoes, even better). Take along some fire starter. You can’t always assume there will be dry tinder readily available. Have some paper, fire starter-sticks, or whatever you find to work best and, of course, matches. If you need a fire in a hurry, this will speed things up a lot. Double bag it in ziplock bags. 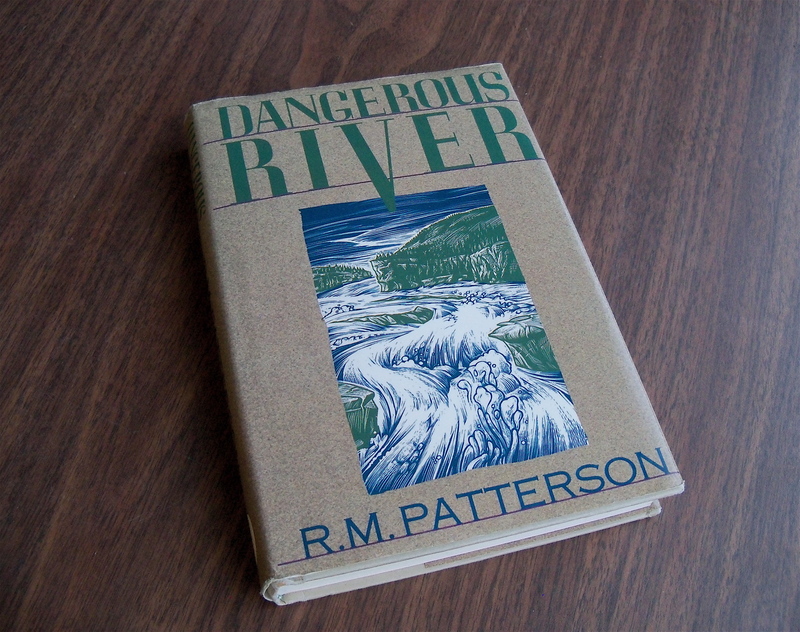 I finished Dangerous River by R.M. Patterson less than half an hour ago. As I read the last twenty pages or so, I savoured every word, wishing it could be a little longer, but feeling the end approaching with every paragraph. Spring was descending on the Nahanni River, which would bring the story full circle. It will be difficult to summarize Patterson’s incredible 270-page adventure, but I will try. R. M. Patterson weaves a beautiful tapestry as he tells the story of his two excursions into the Nahanni country of the Northwest Territories. He went the first time in the summer of 1927, as a man with minimal wilderness experience but more than enough heart. He knew little of the country, but as he travelled North, through Fort Smith and Fort Resolution, he heard more and more legends about the First Nations people of the area — he called them “Indians” — and tales of lost prospectors, unsolvable mysteries, hidden gold mines, betrayal and murder. In the book, he recounts these legends at length, which gives a great background for the adventures to come. In May of the following year, 1928, he returns to the Nahanni country with his friend, Gordon Matthews and a team of dogs. Through record-breaking flood levels, they work a three-canoe rig with small kicker upstream, although on the very first day going up the Nahanni, the kicker falls to disaster (a submerged deadhead). They continue on manually, ferrying above churning rapids, tracking in waist-high water, and surviving more than a few close calls. The author, however, knows when to call it quits and wait for the river to fall a little, or when to change techniques or simply accept that the risk is too high and a portage is necessary. He and Gordon make it up to Deadmen Valley where they establish a camp, complete with cabin, cache, traplines and hunting grounds. The story continues as autumn descends and they work through the transition to frozen winter. 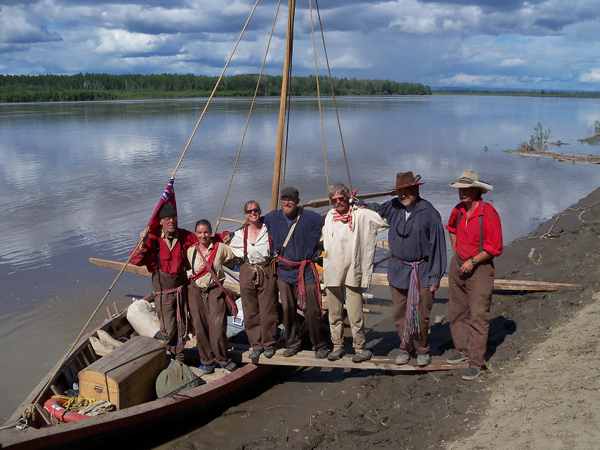 They travel extensively around the valley — by canoe until there is too much ice running, on foot and later using dog sleds. There are many stories within this book, but I will just mention one: in late December, Gordon makes a trip to Fort Simpson with the dogs. He has to turn back once due to open water, so back at the cabin, they rig up a nested sled to hold a canoe, which then holds the smaller dog sled, and he switches to the canoe where the open water is. Suddenly, a wind comes up, the dogs get scared and all go to one side so the canoe capsizes! Luckily, they are near shore and he manages to save most of his gear; all the dogs swim to shore and he lights a huge bonfire from driftwood nearby to fend off hypothermia. He eventually arrives in Fort Simpson but is held up there due to major blizzards. When he doesn’t return on time, Patterson goes looking for him on foot, and through countless trials — which I won’t go into… I don’t want to give away all the suspense of the book! — he walks all the way to Fort Simpson where they are happily reunited. They return to their cabin later and continue to thrive through the winter and spring in the beautiful Deadmen Valley. I’m afraid this review simply cannot do justice to the journey that Patterson was on! Although it was full of struggles and trials, much of it was borne happily, it seemed, and only in the truly miserable circumstances did he complain. As in all our lives, times of ease and joy balanced out the challenges and hardships; he truly seemed to know how to thrive in any circumstance. Patterson’s experiences in Dangerous River cover it all — hunting, trapping, wilderness living, dogsledding, canoeing and survival. I highly recommend this book! I find it hard to blog about summer things when I’m caught in winter’s icy grip, however, I thought I might do a couple of book reviews. 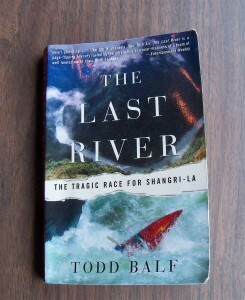 I recently read Todd Balf’s book The Last River — the Tragic Race for Shangri-La. The book tells the tale of four men (plus their support team) bent on paddling, or at least seeing and portaging, the most remote parts of the Yarlung Tsangpo river in the remotest parts of Tibetan China. It is among the Himalayas, in that part of the world where the borders of India, Bhutan, Nepal and Tibet all meet. Like Everest, which is in the neighbourhood, the physical challenges the Tsangpo presents are beyond what one will find in other parts of the world: the steepest gorges in the world, the wildest rapids. The Tsangpo is a big volume river in one of the most difficult-to-access places on the planet. Balf starts out giving a great historical overview of British explorers who began their attempts to chart the river in the 1860’s – 1920’s, when India was a long, unwieldy arm of the British empire where men campaigned for money to go on African safaris and it was normal to bring exotic species back to your sponsors or country as samples. One explorer, Francis Kingdon-Ward was even moderately successful in the Tsangpo gorge, but a gap of at least five miles of river remained completely unknown to the western world, and it was that section in particular that this modern group of intrepid explorers wanted to see, and if possible, paddle. There were early rumours of a 150-foot waterfall in the area — not hard to imagine on a river that drops 10,000 feet in a hundred-plus miles, although the rumour turned out to be caused by an error in translation. The area is mountainous, to say the least, and those early explorers believed that Shangri-La — a paradise of indescribable beauty — was hidden among its valleys and lush vegetation. On the whole, the book is a comprehensive look at the expedition, covering every angle and many details, including a significant look at the sport and culture of whitewater kayaking. Why do people take risks? Is it acceptable to take such risks when you have a wife to widow and children to orphan? On the other hand, should one have to give up one’s passions for safety and security? Must you climb “the Everest” before you? What affects a paddler’s decisions, as he or she scouts and paddles the water, or chooses to portage? Is there undue pressure put on paddlers by their funders to “make it happen?” Todd Balf’s treatment and discussion of these issues is sensitive and multi-faceted — making for an enjoyable and thought-provoking read. Happy New Year! As we look back on 2012, we wanted to share some things that we’re very pleased about and some things we are looking forward to in 2013. Hooray for another successful York Boat expedition! Along with Jae Penner of Peace Valley Woodcraft and everyone at GeoTourism Canada, we are so pleased with how the trip went this year. 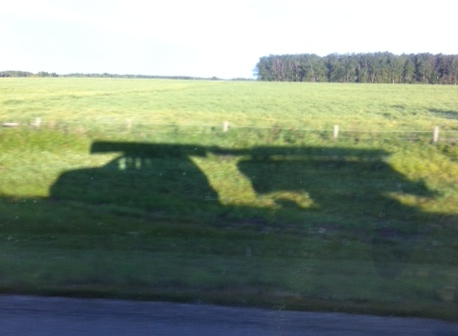 Stay tuned for plans for 2013! We are working with all the partners and past crew members to formulate the best plan for offering both long and short trips on the boat. It is such an amazing experience, we are looking forward to sharing it with more people. If you are interested in being a partner, please contact us without delay! We once again offered several successful canoe camps, including a very special one for the students of the tiny country school, Dr. Mary Jackson School. The students and principal were such a joy to work with! Thanks so much for making that canoe camp so rewarding! This canoe camp was actually “Paddle the Peace Junior” (read more about Paddle the Peace below). 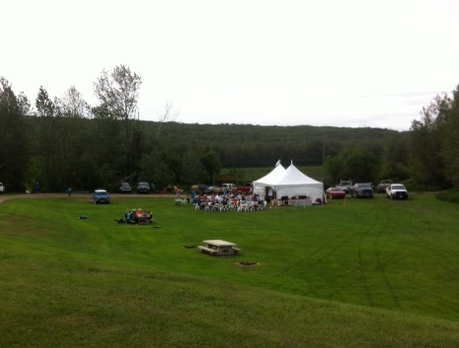 We once again partnered with the County of Northern Lights, Northern Sunrise County, the Town of Peace River, GeoTourism Canada, Mighty Peace Tourist Association, the Government of Alberta and the Alberta Sport, Recreation, Parks and Wildlife Foundation to offer Paddle the Peace in Peace River, AB. Weather for the day was perfect and we all agreed that the August date worked better than the June date we had tried in 2011 (it was cancelled that year due to high water levels). Flow North offered canoe lessons for adults — which were completely sold-out — as well as helping with the safety briefing and other logistics on the day of the event. We’d really like to thank Teresa Tupper from the County of Northern Lights for all her hard work! Teresa was pleased to do a 1+ hour presentation at the Peace River Museum and Archives this year. She spoke about her solo paddling, sublime experiences on the river, and how surviving a thunderstorm outdoors with no shelter changed her life. Everyone in attendance thoroughly enjoyed her slides and storytelling. Teresa and Cheryll also gave a presentation to two lively grade two classes from Florence Macdougall School in High Level. The kids loved seeing pictures of the York boat and touching the HBC coat, but I think what they remember most is the taste of bannock and dried moose meat they got to try! As mentioned, we are working on the exact details of our York boat offerings for 2013. We know you need to plan in advance, so we’ll be releasing the plan soon! We will once again be offering trip guiding to interested groups — please contact us well in advance so we can discuss where you would like to go and what we can do to make your trip extra-special. We are still happy to offer our drop-off and pick-up service for those paddling long distances. 🙂 Making use of your vehicle is the most economical way, but even if we use ours, it’s not as expensive as you might think. Contact us for more info!